Ayios Efstratios (Άγιος Ευστράτιος) or Ai Stratis or Agios Efstratios is a small and isolated island (about 20 nM south of Limnos) with an area of 43.325 km² and 250 inhabitants. It is definitely off the beaten track. The island has been inhabited since the Mycenaean times and on the island's north coast are still the ruins of the original Mycenaean settlement. The recent history of the island is rather infamous. Starting in 1936 the fascist dictatorship of Metaxas used the island as a place of exile for the undesirable communists, a practice that was resumed by the junta of 1967. The most famous of these deportees was the celebrated composer Mikis Theodorakis. In 1968, an earthquake devastated the houses of the little port village. Fishing and low-level tourism are the main occupations of today's inhabitants. Most approaches to Ayios Efstratios are without dangers and straightforward. There is only one port, the harbor of Ayios Efstratios. 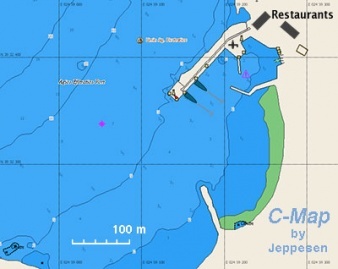 It provides fairly good shelter from the meltemi but it is open to SW. Go stern-to the usually crowded by fishing boats quay, avoiding the SW corner where the ferry from Limnos docks. The bottom is sandy with scattered rocks and affords good holding, if you hit the sandy patch. Fortunately the water here is very clear. The fishing boats can be rather malodorous and may be keeping their VHF's at high volume. Otherwise this can be a pleasant anchorage. Other than walks there is not much that a tourist can do here. Enjoy the clear sea. There are two restaurants and two bars. There is a ferry, 4 times a week, from Kavala via Limnos, and once a week from Chios.